So you hear that influencer marketing is a must but you don’t have £50,000 to pay a celebrity to post on Instagram. Lucky for you, there are many options out there for a company to integrate Instagram influencer marketing without blowing your entire year’s budget. Why is Instagram Influencer Marketing So Popular? For some companies like Wendy’s, NewsWhip says engagement on influencer paid posts run up to 100 times the engagement of a brand’s own post. In terms of ROI, TapInfluence’s study found influencer marketing is 11 times more effective than traditional marketing efforts. When used effectively, influencer marketing can play a big role in your campaign. For example, Cleanly targeted a person who is often on the go and could use a laundry service. Ideally, the audience is also comprised of travel enthusiasts and could take advantage of Cleanly’s services. Approach your Instagram influencer marketing budget like you would for any marketing opportunity. It can be included in your annual marketing budget, monthly social media spend or even part of a campaign budget. Once you have a cash amount in mind, decide how to best put it to use. LIFEWTR partners with creatives and its influencers match that segment. Matt Allard’s account is filled with mostly personal explorations, so a sponsored post has an even higher impact on LIFEWTR’s followers. We’re using the term “campaign” a bit loosely here. Instagram influencer marketing can be ongoing and/or it can be specific to one marketing campaign. In either case, creating your campaign is similar. 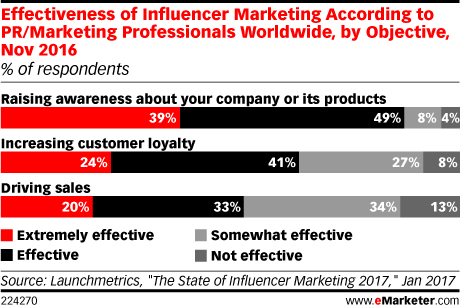 In a recent survey from eMarketer, 88% of marketing professionals found influencer marketing to be effective or extremely effective at raising brand awareness. The study makes sense. We tend to trust our peers’ opinions on brands more than word straight from the brands’ mouths. With this in mind, you should determine what your own goals are for setting up influencer marketing. Influencer-specific discount codes: The number of times each code is used. Referral links: The total number of clicks and successful conversions for each link. Engagement: If it’s a public post, you can track the number of engagements. If it’s an Instagram Story post, you can request analytics from the influencer. New followers: If there are campaign dates, then this metric could be used. New customers or purchases: If the campaign or program is about a specific product or service, you can track sales to see if they increase. In the above example, Christiann includes a discount code in the caption, making this an easy metric to track for Kura Nutrition. Just like your usual customer profiles, influencer profiles consist of demographics that you want to target. If your budget is small, you’ll want to aim for micro-influencers. These are accounts with usually less than 1,000 followers but have a highly engaged audience. 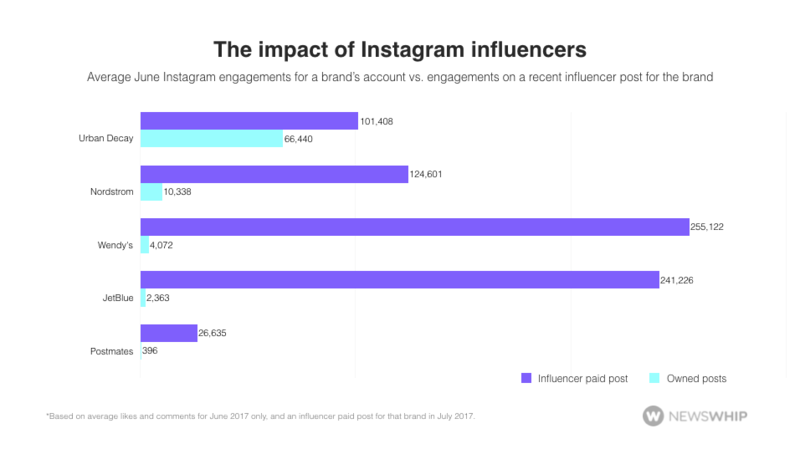 In fact, Influence.co released some statistics on average costs per influencer by number of followers and their respective engagement rates. Follower count is still a high determiner of influencer value. However, it’s a better investment to use micro-influencers than celebrities. 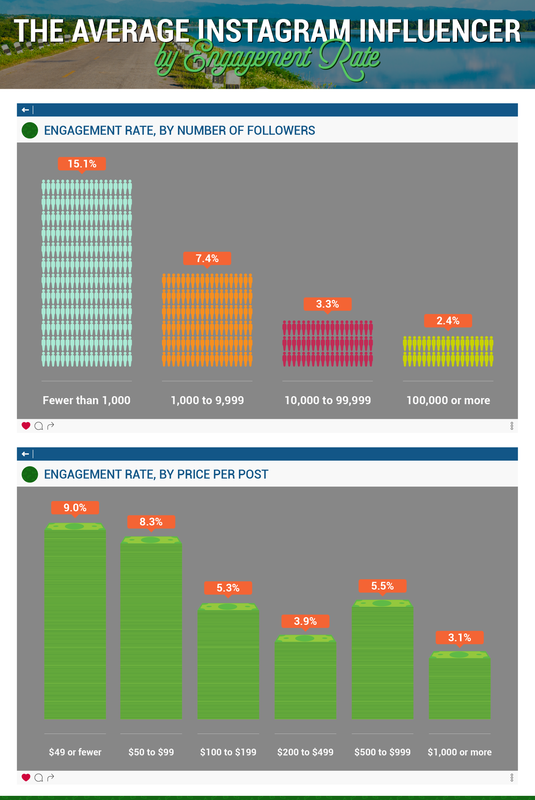 Posts that cost $49 each had the highest engagement rate at 9.0% when compared to other post costs. Based on the budget you determined earlier, you can now estimate how many influencers you’re able to account for. As we had mentioned before, cash is not the only thing you can offer an influencer. Sometimes a service or product exchange is enough if the interests match. Influencer marketing can include special events like this Grey Goose dinner Instagram post example. Events can be run on a budget as long as you’re offering something exclusive or enticing enough for people to want to join in. If you’re struggling with figuring out the financial end, take a look at this post: How Much Should You Pay Social Media Influencers? This is a key part of Instagram influencer marketing. After you’ve created your ideal influencer profile, you need to make a big list of all the accounts that match the profile. Make sure you include contact information in your list. Some influencers list contact information in their profile while others state their preferences in their website. Hopefully, you already have some people in mind who would be a good fit. If not, you can do further research through tools like Klear and InfluencerDB. There are many free tools out there and most have paid tiers too. Don’t only trust the tools. Be sure to do your own research on each profile as well. Gnarly Nutrition’s customer base is all about healthy eating. Naturally, athletes and people interested in exercise are a great fit for the brand. Products don’t have to be in a photo for a sponsored post to be effective. An influencer’s honest captions and lifestyle photo is a more subtle form of advertising. Don’t be afraid to branch out. Marshall Movie could’ve easily found film enthusiasts to talk about their film. Instead of only going the obvious route, they connected with artists like Jade to talk about why the movie was important to them. The caption and photo is all in the creator’s style and offers a unique perspective on the film. During the research phase, you should’ve written down how to contact them. Now is the time to draft up your email or Instagram Direct Message. If you’re running a campaign, you’ll want to note what you’re asking of them. Do you want them to test a product? Do you want them to post a discount code? Remember, if you have a small budget, you probably won’t be able to ask for too much. You can have guidelines in what you’re looking for but you should give the creators creative control over the posts. Too much oversight leads to a post that reads like an ad. Clearly, this post is part of a larger Petco campaign. Some of the words were given to them by Petco, but the imagery is in line with the rest of the account. One note to mention here is that if you have an ongoing Instagram influencer marketing campaign, you should begin conversations with targeted influencers before you start asking them for posts. Once you’ve built up a relationship, it’ll be easier to ask and even easier for them to say yes. 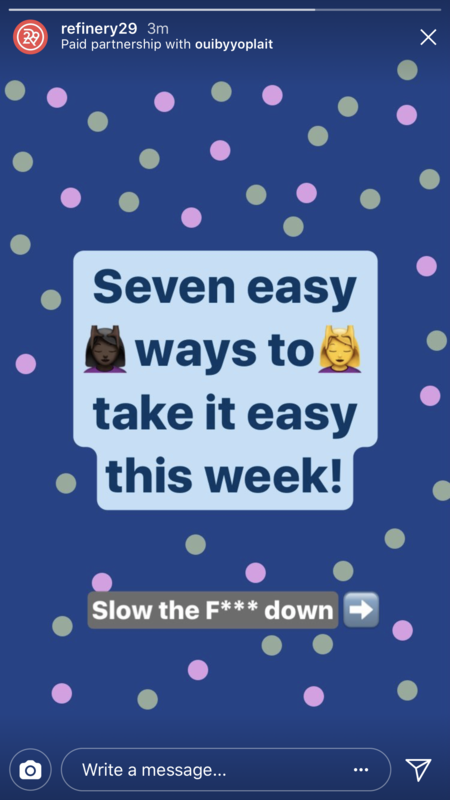 Newly announced, Instagram is rolling out Branded Content features in both posts and Stories. The feature announces paid partnerships to disclose when a creator or publisher had an exchange. While #ad and #sponsored may still be used in posts, the Branded Content feature also allows publishers access to the creators’ analytics. For publishers that include influencers frequently, this tool could be a very useful tracker for your ROI. World Market’s Ambassador Program is clearly laid out on their site and has a corresponding hashtag. If your influencer marketing is part of an ambassador program, you can easily monitor hashtags to respond quickly to their posts. 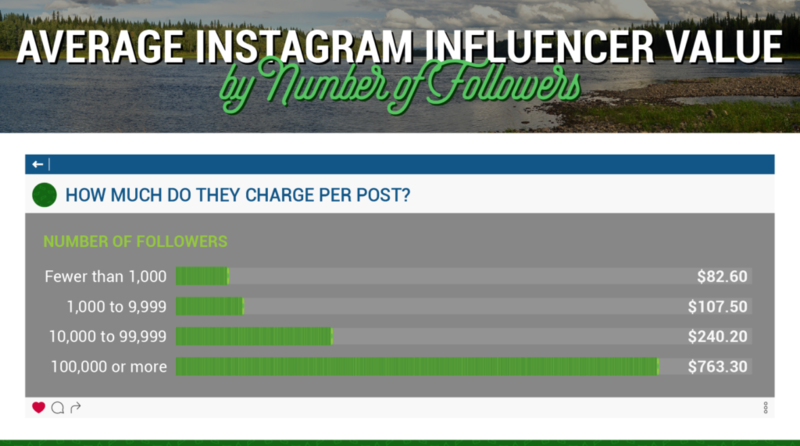 You can use Instagram influencer marketing effectively and with a small budget if you plan carefully. Instead of the usual free product and cash in exchange for a post, consider other options like special events and giveaways. With a little creativity, you’ll find that your brand can reach new audiences without Selena Gomez posting about it.